Gunfights are obviously illegal in contemporary societies, but there were times when fighting with guns, if between two people, was an acceptable way to resolve a dispute. These fights were called duels. In both literature and the real world, duels have been a feature throughout European culture and history. Weapons varied, including guns, swords, spears on horseback - called jousting - or bare-handed boxing. Duels usually involved strict rules of engagement agreed to by both parties beforehand. Some duels were high-profile events. The famous French painter Edouard Manet had a sword duel with a friend who had written a poor review on his works. 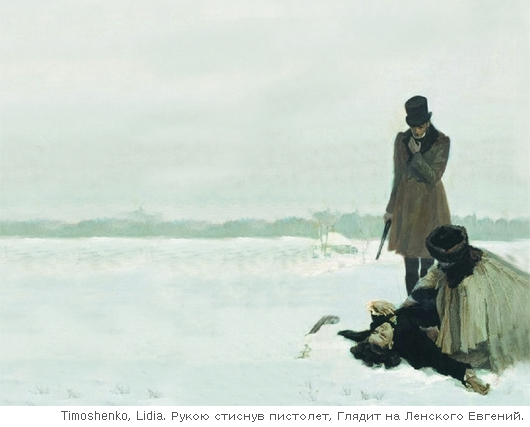 In one of many examples of duels portrayed in literature, the Russian poet Alexander Pushkin, in his verse novel Eugene Onegin (Евгений Онегин, Yevgeny Onegin), also depicted a man who had to challenge a friend to a duel. And later, this duel was brought onto the stage as an opera by Pyotr Ilyich Tchaikovsky, one of the Russia’s most prominent composers. Like many duels in theater, film, and literature, this one is the result of a feud between two men over the love of a woman, a common cause of great tragedy in literature. Tchaikovsky’s fascinating work was chosen by the UOS Department of Music for its biennial concert, with performances on October 29 and 30. Eugene Onegin was originally written by Pushkin as a verse novel, but in 1878, it was transformed into an opera by Tchaikovsky and Konstantin Shilovsky. The novel tells the life story of Eugene Onegin, a man who represents the young but helpless intelligentsia of the time. From this story, Tchaikovsky picked up several scenes and wove them into an opera. In a letter to his student Sergei Taneyev in 1878, Tchaikovsky showed his affection for the work by saying that he would be satisfied if listeners found only a small fragment of what he felt when composing it. The opera consists of three acts in seven scenes. Even though the acts are in chronological order, they do not make one continuous story and are just selected highlights from the original work. This is because Tchaikovsky expected audiences to fill in the omitted parts of the well-known story. For this reason, he called his work “lyrical scenes” rather than an opera. Onegin shortly gets bored with rural life. At a ball given for Tatyana to mark the day honoring her name, Onegin complains to Lensky about being brought to the boring party, and decides to show his annoyance by dancing with Lensky’s fiance, Olga. Olga continues dancing with Onegin, enjoying Lensky’s jealousy. However, the situation turns in an unexpected way. Lensky loses his temper and, after quarrelling with Onegin, challenges him to a duel. Onegin feels embarrassed and expresses regret about being so indiscreet; still he has no choice but to accept Lensky’s challenge. At dawn on the day of the duel, Lensky sings an aria expressing his regret over his own choice. Nevertheless, no one can stop the fight. After a single gunshot, Lensky’s body collapses. Quivering, Onegin becomes a fugitive, wandering and hiding for years. After years of roving, Onegin arrives at a ball given in honor of another nobleman, Prince Gremin. There he sees Prince Gremin’s wife, Tatyana, the same woman he had once regarded as an immature country girl. She is now noble and graceful, not the girl he used to know. The moment he sees the noblewoman, Onegin is blinded by a sudden surge of intense emotions. This time Onegin writes a letter to Tatyana to meet her, only to hear her refusal of his confession of love. Onegin starts to beg for her love. Tatyana sadly says that they were once close to being happy and that she still does love Onegin. Yet, she asks him to leave, saying that she is now married and determined to be faithful to her husband. After saying farewell forever, Tatyana leaves Onegin alone. In despair, he cries about his miserable life. The UOS Department of Music holds a regular concert every year, alternating between opera and instrumental pieces. The program for the concert in October 2015 was Eugene Onegin, and the concert was for two nights. The orchestra and most cast members were the same for both performances, except for major roles Onegin, Tatyana, Lensky and Olga. 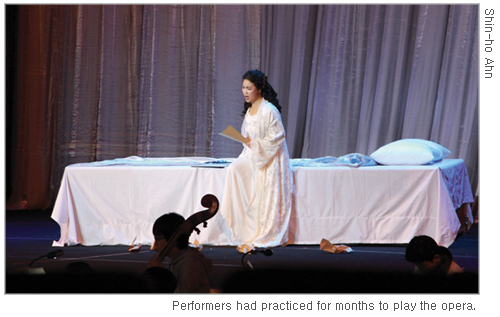 Librettos were translated into Korean, but principal arias were sung in Russian. The orchestra’s accompaniment was nice, but the music often was too loud compared to the singing. This was mainly because the orchestra pit was not actually placed lower than the ground, thus not working as a silencer. Stage settings were minimalist, but quite appropriate to deliver the sentiment of the scenes. In the first performance in October 29, singing was fine, but sometimes drowned by the music. Lensky nicely played as a nervous and hot-tempered character. The two male leads were a bit out of sync with the music during the duel sequence. However, as it was explained later, the unintended time lag had an unexpected effect. In the second performance, the singer playing Tatyana, with her rich voice, did well in her arias. Compared to the day before, the duel sequence was played smoothly without pauses in motion. The last scene, where Onegin and Tatyana sing passionately, was also played well with deep emotion. Overall, both performances were of fine quality, charmingly played without a major mistake. After the curtain fell, all performers seemed greatly pleased that they had completed the opera successfully. In the first day’s performance, the singers playing Lensky and Onegin had a short mysterious pause before they pulled the trigger. Actually, the pause was not intended; the performers were a bit out of sync with the music. But this unintended halt gave the audience a feeling of hesitation, an appropriate hesitation, considering their friendship. And this also leaves the audience wondering whether Lensky ever pulls the trigger, thus giving up his life instead of shooting his friend. In this sense, Lensky’s death can be understood as his apology. He is able to offer it only at the last moment, which is too late. Onegin, who submits to honor’s rule, spent years of guilt not knowing that another trick of honor is awaiting him. The opera uses a device of reversal in the love between Tatyana and Onegin. 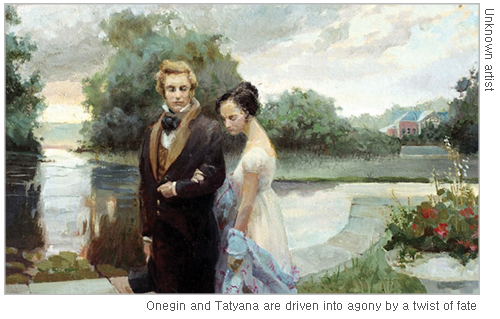 When Tatyana first sees Onegin, she is attracted by his intellectual abilities, which have also made him a cynic. When Onegin later sees Tatyana, he is charmed by her grace and nobility. It is ironic that what made them fall in love is what made the other refuse to love. Onegin coldly regards Tatyana’s love as young and inexperienced. Tatyana, who says she still loves Onegin, bids him farewell to keep her marriage, thus her grace and nobility. Both of them suffer in despair when their love is frustrated. Tchaikovsky was apparently deeply affected by his work with this story. Deeply understanding the sentiment of Onegin, Tchaikovsky faced a similar dilemma in his own life. A woman named Antonina Miliukova once sent the composer a love letter. He did not feel the same love for her as she expressed for him. However, since he did not want to be as cold-hearted as the character Onegin, Tchaikovsky decided to marry Miliukova. The marriage was a disaster many years later. Even more disturbing is that Pushkin, writer of the original work, also died in a duel. He challenged Georges d’Anthes, alleged lover of his wife. Dying slowly after being shot in abdomen, did he think of Lensky?